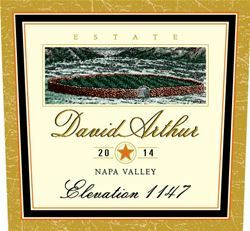 Owned by the Long family since the 1950s, the winery and estate vineyards of David Arthur are situated high above the northeastern end of the Napa Valley, on Pritchard Hill. Today, founder David Arthur Long and his daughter, Laura manage the winery together. The vineyards offer breathtaking views of the valley ﬂoor 1200 feet below and boast rocky volcanic soils with a unique microclimate of very warm days and cool nights. The rough terrain stresses the vines, limiting grape production to tiny berries that may be small in stature, but provide immense concentrated flavors in the wines. With every vintage comes a commitment to producing distinctive wines with a focus on vineyard site-expression and structure, a benchmark of David Arthur Vineyards’ winemaking philosophy. Intimate tour experience, usually given by a member of the family. Please call for a reservation, as tours and tastings are given by appointment only. No walk-ins please.